The Japanese is playing so well now, running forward, slapping the balls, returning consistently. Gulbis came out of nowhere. He cracked the top 10 in 2014, and then he went down hard, out of the top 100, even still. But when he is happy, he is very solid. 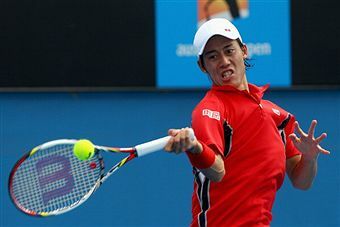 However, Nishikori will move the ball around and when he gets a chance, he will swing away. Nishikori will win in four sets. In some way, Del Potro is a big favorite, but as the Argentine said, Simon may be very old, but he is so, so smart. The Frenchman likes to chip and slice, and he also hits it very hard when he had to. However, Del Potro has brought back his two handed backhand, and he has a tremendous serve. Assuming that Del Potro continues to be healthy, he really has a chance to go even deeper. Del Potro will win in three sets. The Serbian played excellent ball through the first week. Day by day, Djokovic’s mine will be sharp and concentrated. Khachanov is coming up, gradually. He is very tall and the Russian can smack it. However, Djokovic knows how to return, and be thoughtful. He will win in four sets. That was a great win by Su-Wei, who moves the balls all around, and she really hustles, upsetting Simona Halep. Cibulkova, who reached the Aussie Open a couple years ago, is really hustling. She is so quick and she returns very deep. This will go for a three setter, and they will put together some high quality rallies. Cibulkova won’t back off and win it 12-10. Now here is an astounding match, with the German and the Swiss women facing off. Kerber says she is super steady, but here, she pushes herself and she wants to crack the winners. Bencic is finally back, healthy and raring to go. Once again, there will be three sets, and Bencic will find the lines and grab it. Kasatkina gets better all the time, on the hardcourts, clay and now on the grass. Van Uytvanck has been there for a while, and she hasn’t gone deep at the Slams, until now. She has chanced her tactics and she breaths. Kasatkina will be forceful and out hit her in straight sets. The 2017 RG champ Ostapenko is on fire, on grass, that is. She is the biggest hitter on the planet. The Belarusian Sasnovich has become a little bit more solid, reaching the final at Brisbane in January. Ostapenko can get angry when she makes a lot of errors, but still, she keeps going and going. She will in straight sets.